Use MT BlitzPlan online: Create and file your IFR flights mobile with our new, optimized website design for comfortable handling! MT-Blitzplan instantly composes a 100% CFMU conform routing. It can not be rejected. IFR Flightplanning directly from the cockpit. The flightplan is immediately available for the tower and all sector controllers concerned. Instant Flightplan activation from the cockpit by the touch of one button. 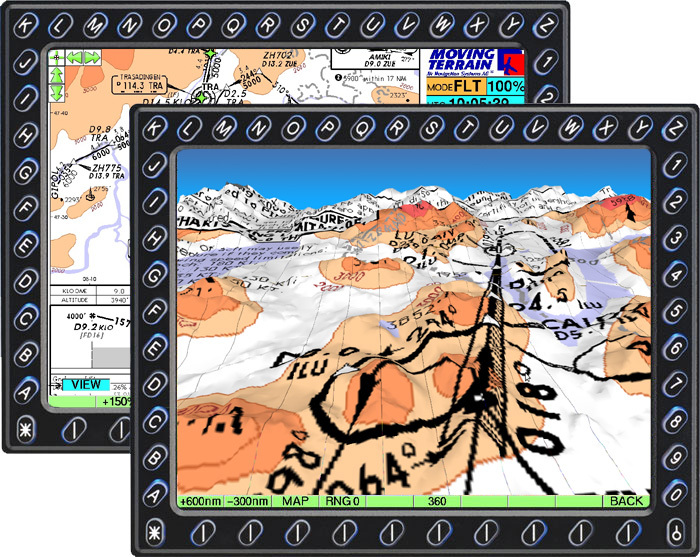 The complete routing and the additionally computed flightlog will automatically be entered into your MT-VisionAir FMS. You insert STARs and APPROACHEs as cleared by ATC. Automatic route insert into MT-FMS by the touch of one button. 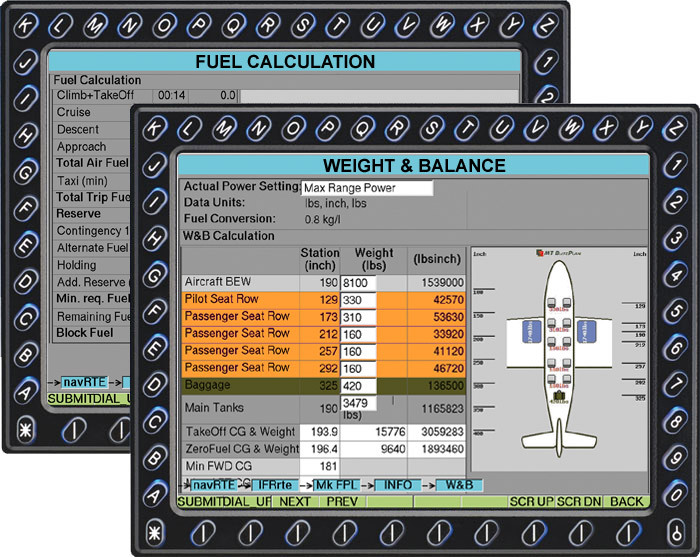 Weight and Balance is calculated in a few seconds for the respective flight using predefined aircraft data and a graphical loading page. 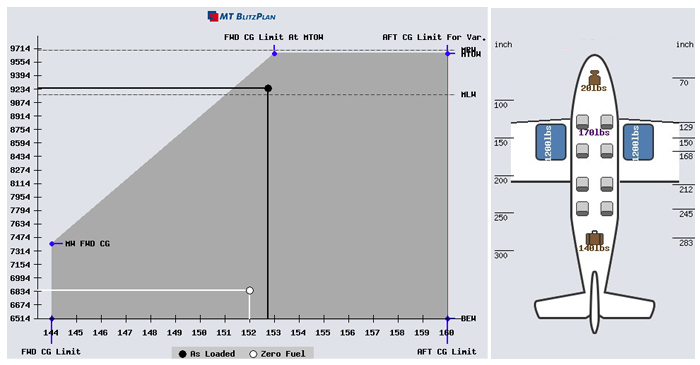 The CGs and weights for takeoff and landing are graphically presented in the limit diagramm. b) the aircraft performance sheets. The pilot has no further work to do but choosing the power setting. 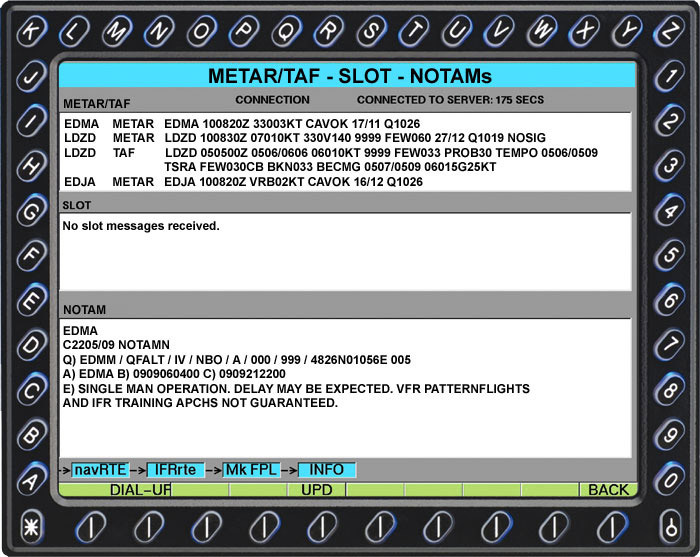 MT-BlitzPlan automatically polls METAR/TAF for Departure, Destination and Alternate - before takeoff and enroute before landing. Slot information and other messages are clearly shown and can be updated if necessary. MT-BlitzPlan automatically polls the relevant NOTAMs for Departure, Destination, Alternate and enroute. Always there: cleanly structured, and always up-to-date JeppView charts. With these you can be independent of any location, and you can always plan your route anywhere and print out the charts if required. 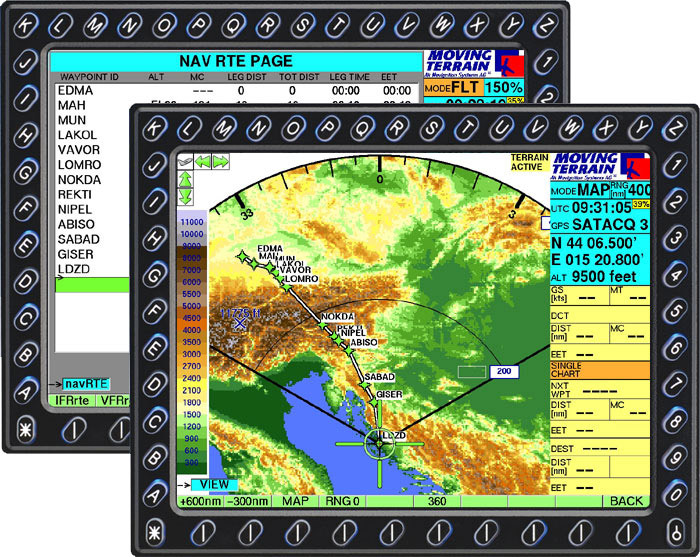 a) The "classic" 2D view to display all information of the further flight route. This allows smart planning. b) The 3D view in combination with MT Relief Dynamics. This allows an optimum evaluation of the terrain in combination with all relevant information from the chart. JeppView charts in the cockpit. Instant Flightplan Activation by the touch of one button. MT-BlitzPlan provides all procedures (Departures, Arrivals, Approaches and Terminal Waypoints) of IFR aerodromes on Google Earth. Replay your real flights flown with MT-VisionAir with Google Earth! Helpful information concerning your flightplan for free. 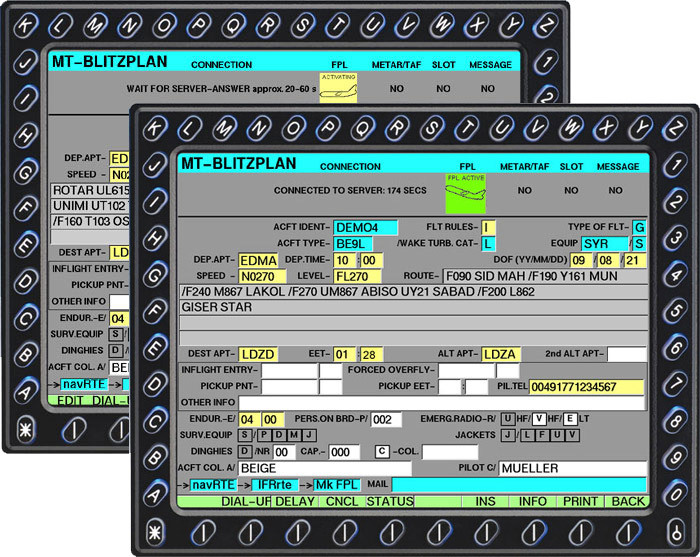 MT-BlitzPlan – the most easy to use routefinder on market! All calculations are done automatically after a valid route is found. 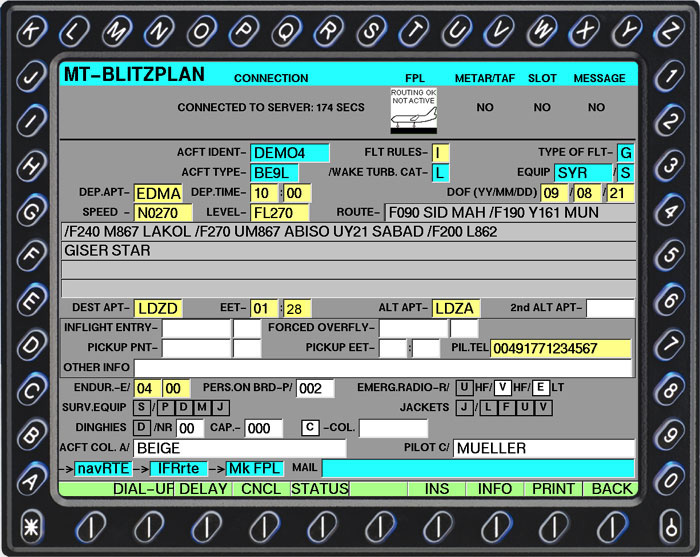 Interested in IFR Flightplanning with MT-BlitzPlan? Office hours: Mo-Fr: 8:30 a.m. - 5:30 p.m.